A very happy Mother’s Day to all of the amazing moms I know, and there are myriad. I lived with my own mother until I was around seven. I don’t have as many memories of her life as I would like, but I still remember her fondly on Mother’s Day. 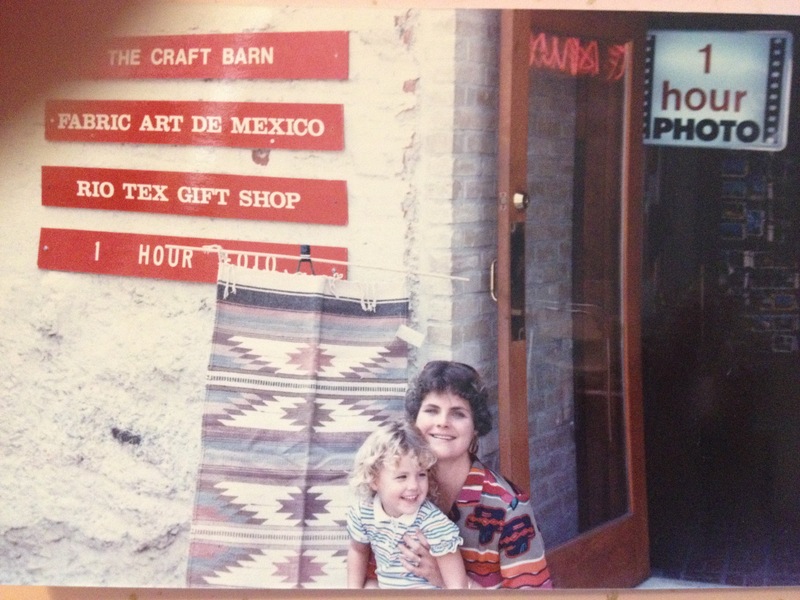 I am so grateful to the woman who brought me into the world, no matter how imperfect she may have been. I have few photos of my childhood, but I found this one tucked away in a book on a bookshelf. It makes me smile. This Mother’s Day weekend, my husband was at the hospital, “fixing faces,” as my four-year-old says. She wants to be a surgeon too, and a “chef” like her mom. I remind her I am a home cook and not a chef! Still, she proclaims, “You are the best ‘cooker’ ever.” On Sunday, I indulged myself by starting the dough for a terrific roasted apple bread. I love bread, and I love the process of making it. Of course, I don’t always share our family’s many fresh loaves on the blog. The truth about our little life: this family is constantly cooking, baking, thinking about what will be prepared in the near future or obtaining ingredients for something yummy. Blogging of course, is a different story. There is always time for cooking with family and friends or even alone in a quiet kitchen. It’s a special day when the food comes out perfectly enough to share, and there is enough time to photograph, write and post a blog entry. Today is one of those days! I am completely obsessed with baking delicious, yeasted breads. There are so many recipes to try… and so much bread to eat. I would not have it any other way. This morning baking, a scrumptious roasted apple bread, swirled with warm spices, is in the game plan. The dough was made yesterday and is ready to go. I roll out the dough and sprinkle the top with rich, roasted fruit, sweet sugar and aromatic, complex spices. 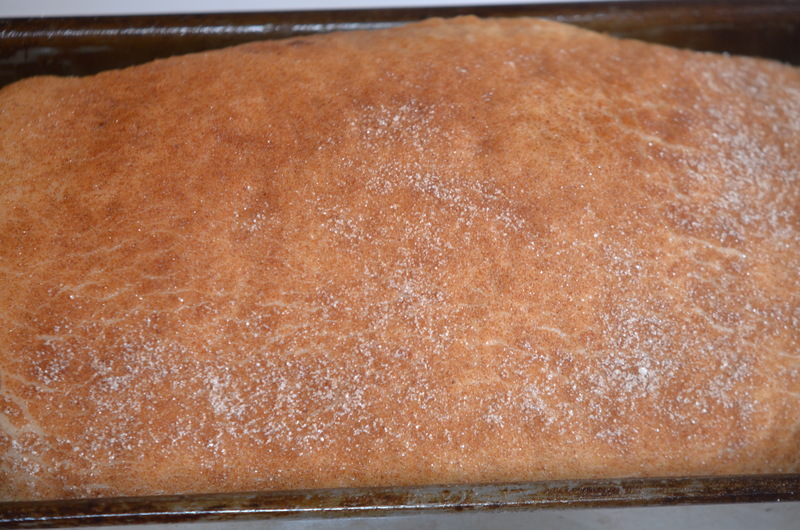 The dough is rolled up and placed in a greased loaf pan. A splash of melted butter and extra sprinkling of goodness never hurt. 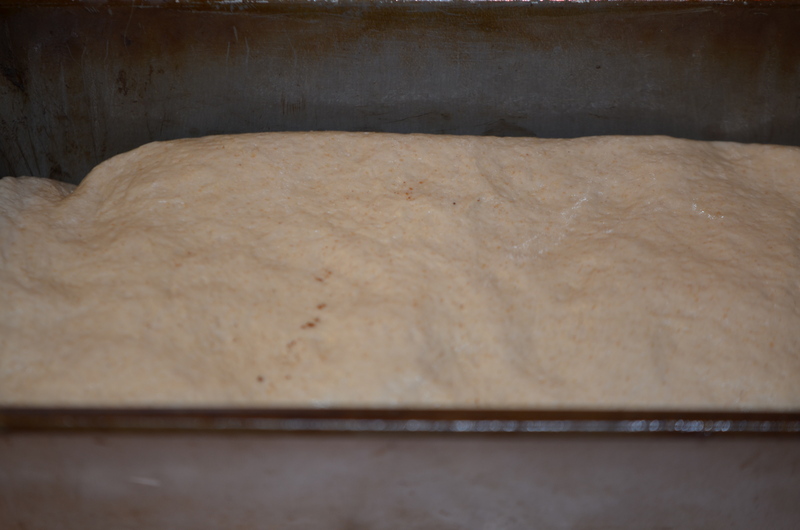 The dough completes its final rise in the loaf pan. It emerges from the oven perfectly golden and redolent. Of course, the bread must cool slightly, which is when patience is involved (not my forté). While my slice of bread toasts, I enjoy both ends of the bread. The sugar, butter goodness lies in the crust. There is often not time to take pictures of food when devouring warm bread is involved, but I mange. I can see some delicious French toast in the near future (as in tomorrow!) Any fallen apples are a property of muah (and the perfect chef snack). And, not any honey: Spanish honey! My most amazing husband knows food gifts are the best gifts (this is why he is most amazing!). A second piece is in order and completely justified, thanks to a great morning run. Enjoy with hot, creamy cup of coffee and some family and friends – or on a quiet, peaceful spring morning. Of course, there is not too much quiet and peace for those of us with little rascals running about. Place the first three ingredients in a bread machine. Close the machine. Allow mixture to sit for at least ten minutes, until the yeast has created foam. Add the butter, salt and then bread flour. Use the dough setting to create dough. When dough setting is done, place the dough in a large, greased bowl. Cover with greased plastic wrap. Allow to sit at room temperature for three hours. Place the dough in the refrigerator and allow to sit overnight, for twelve to twenty-four hours. Preheat oven to 400•F. 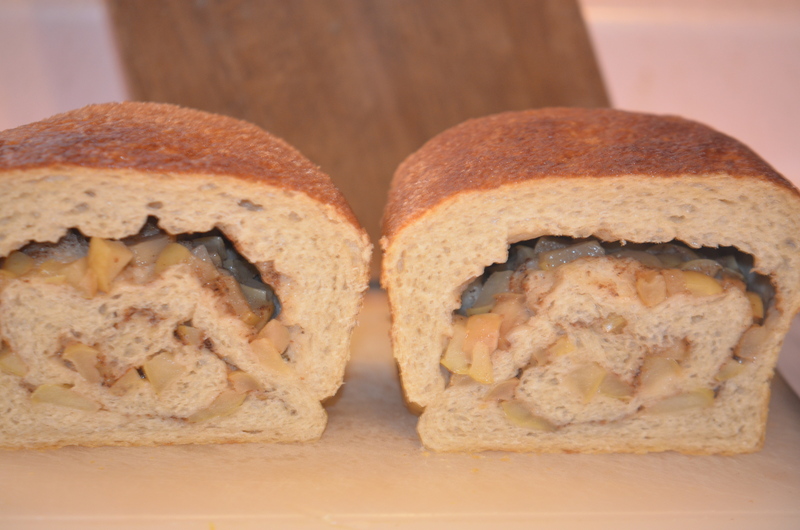 Roast apples in a greased, standard-size loaf pan until tender, about fifteen minutes. Mix the sugar with the cinnamon and nutmeg. Roll out the dough into a large rectangle. 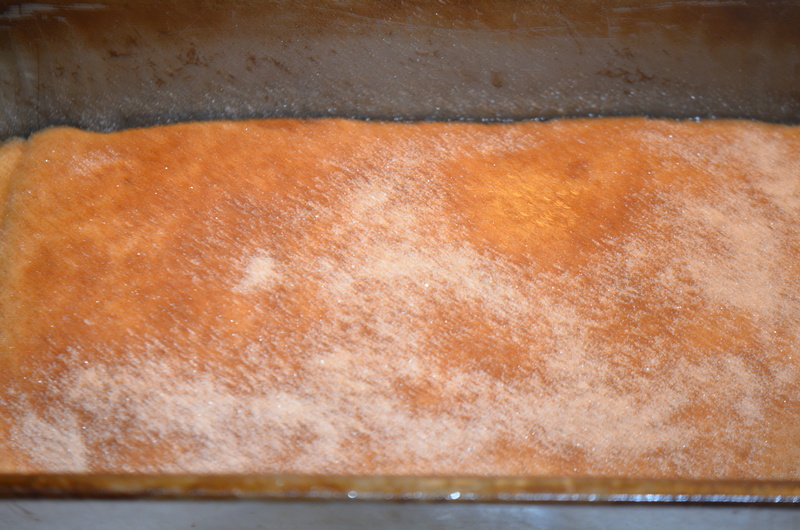 Sprinkle it evenly with the roasted apples and 3/4th of the sugar mixture. Roll of the dough. Grease the same pan the apples cooked in. Place the dough in the loaf pan. 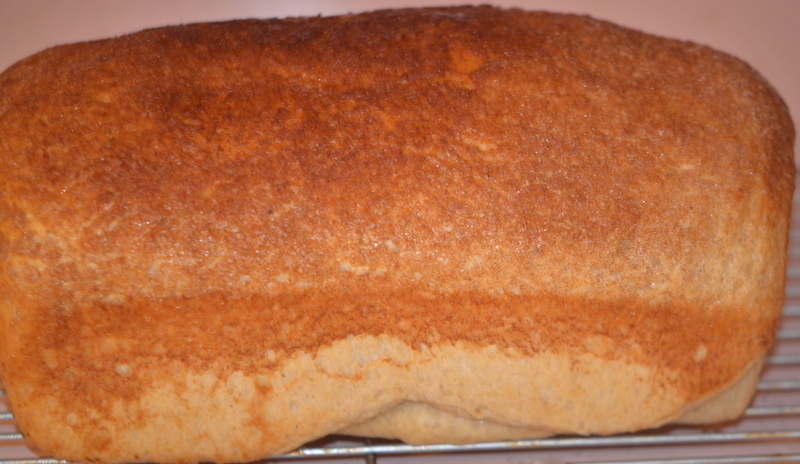 Brush with enough melted butter to top the loaf and the remaining 1/4th of the sugar mixture. Allow to the dough to come to room temperature and rise in the pan, about two hours. The dough will rise about an inch or two over the top of the pan. Cover the dough with parchment paper. Place on the middle rack of the oven, still heated to 400•F. Close door and turn oven down to 350•F. Bake for 40 minutes. The bread is done with it makes a hollow sound when tapped. When cool enough to handle, remove the loaf from the pan and allow to cool on a wire rack for about 30 minutes. Enjoy toasted with melted butter and honey, if desired. ©Shanna Koenigsdorf Ward, shannaward.com (2013-2014), unauthorized use and/or duplication of this material without expressed and written permission from this blog’s author, Shanna Koenigsdorf Ward, and/or owner is strictly and completely prohibited. 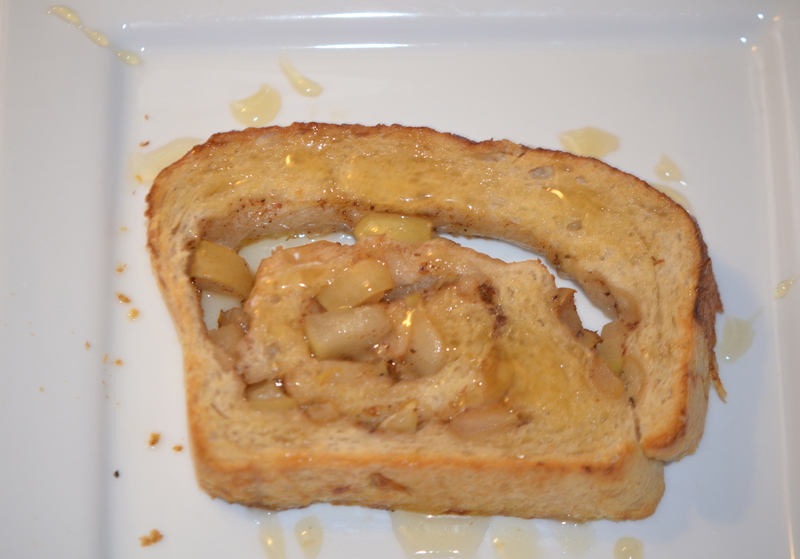 Posted in Bread, Healthy + Sweet Treats, lactose-free, RecipesTagged apple, Bread, cinnamon, roasted, YeastBookmark the permalink. Sofia, Thank you for your lovely words. Be safe and have fun during your travels. I always love hearing from you! Un beso y abrazo muy fuerte. A belated happy Mother’s Day to you, Shanna! The bread looks delicious, and the photo is so sweet–perhaps bittersweet–but you and your mom look very happy in it. I think your son looks like you at that age perhaps? Thank you, Merril! Greg and I both had super curly blonde hair as kids… as do our munchkins. What a sweet photo. And that’s some bread! I want to come to your house and have a slice of this, Shanna! Ummmm, yum! 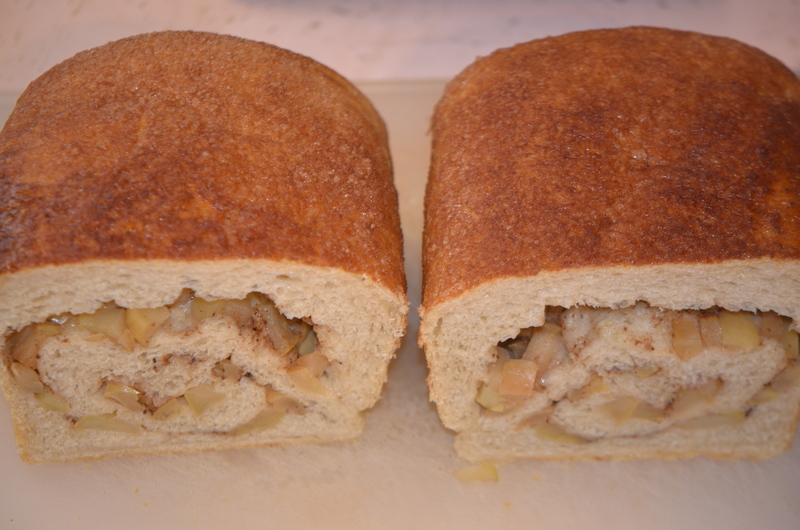 The loaf looks delicious and the apples ooey and gooey – perfect to go with a cup of coffee. I’m still figuring out how to use yeast, but it’s been very fun learning to make bread. I need to branch out though, and this recipe looks perfect! I’m guessing I can do the first few steps without a bread machine (?). Love that it’s an overnight rise, too. I know what you mean about cooking and enjoying the food, but not having time for blogging everything. Good thing we have a lifetime for such things, right? Happy belated Mother’s Day to you, Shanna, and hope all is well! Thank you, Laura. I think many of us have complex relationships with our parents. Fortunately, it fuels us to be the best parents we can and foster loving, tender memories with our own kids. Ah, yes, Spanish honey… I pour that stuff on everything. 🙂 Have a great evening. I will definitely try this one sometime. My boys absolutely love homemade yeast breads. 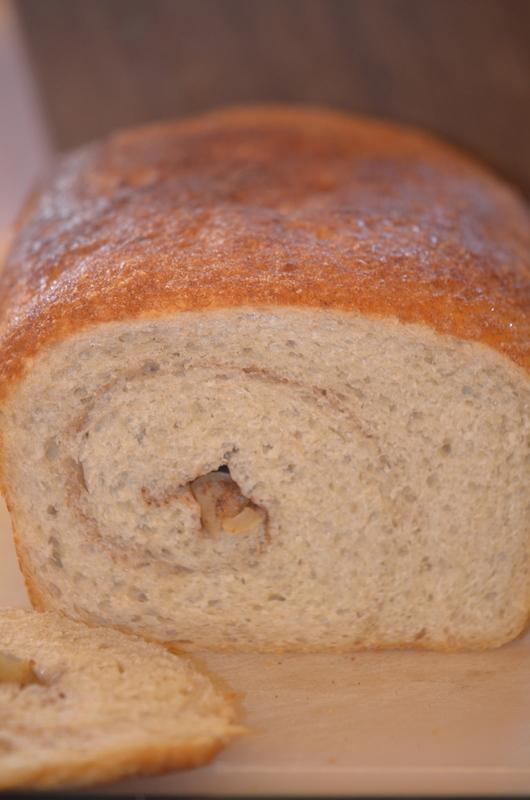 Sean asks every time if I am making the swirl bread, his favorite being chocolate cinnamon swirl bread. They would all absolutely love this bread! I completely understand about not having time to blog it all. With three hungry boys at home I am lucky to get things made, let alone photograph them in proper light. I now have to try to schedule things and that seems to be working a little better. There have been times when the kids grab something while I am trying to photograph it! We’ll see how things go this summer when they are all home and hovering around! Happy Mother’s Day to you! I hope you enjoyed your day. Thank you for the compliments Shanna. It is always a struggle and a learning process. I am curious how this summer the blog will go with all the boys home…I may have to add in photo out-takes of the boys nibbling on what I’m attempting to photograph! Thank you, Bam. I hope you have a wonderful evening – filled with *relaxing* kitchen shenanigans. 🙂 Cheers! YUM! I honestly can’t wait to try this recipe Shanna! And great idea on roasting the apples first – I bet it really brings out a delicious caramel flavor. Thanks for sharing! Thanks, Melissa! The kids are having slices now, toasted, with honey, before Naomi goes to Montessori school. 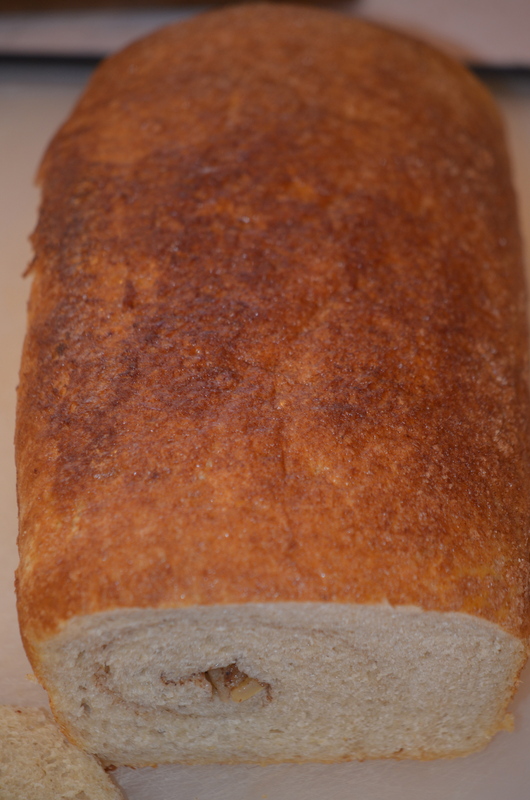 It’s a chilly morning, and the warm, yeasted bread is pillowy and comforting. 🙂 Enjoy your day! lovely, Shanna! It’s been a while since I baked a loaf and you are giving me the urge to do so. Could practically smell your bread with your words and photos. Delicious, all 🙂 And that first photo is sweet. You look like your daughter so very much. Hi, Liz. I hope you try this loaf soon – or any of your favorites. There is something magical about baking fresh bread from scratch.Which reminds me: I need to pick up some more whole wheat bread flour from the bakery! Enjoy your day! Happy Mother’s Day. How lovely to share your delight with this bread – it looks so delicious!!! Family relationships…. oh boy! When I found out that my second baby was going to be a boy too I felt a strange sense of relief. My family don’t do mother-daughter relationships very well. I’m slowly coming round to ‘trying my very best’ rather than the impossible task of being ‘a perfect mum’. Looks absolutely fantastic. I love apples and cinnamon! Thank you so much, Jessica. You will love this bread. 🙂 Enjoy your day! Beautiful post and delicious looking bread! 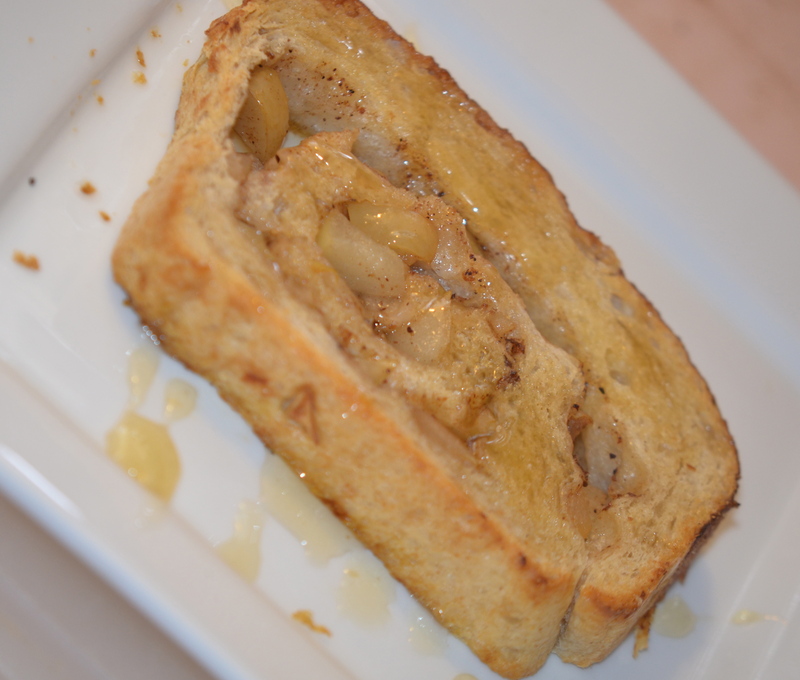 I love the idea of making french toast with this too – must be amazing! Thank you, Laura, for your most kind words! This bread looks so delicious that I can almost smell all its incredible scent from here! Happy belated mother’s day, Shanna (in Span we celebrate this day the first Sunday in May). The kids are so funny…. the expression “fixing” face makes laugh a lot! You bread is really tempting my dear Shanny, the flavour in the kitchen I’m sure had to be amazing! I hope you had a great Mother’s Day! I see your blog has changed somewhat since I was last here Shanna. And I’m glad you’ve figured out the photos. That is truly a gorgeous bread. I too love to bake bread. Those cinnamon apples within look scrumptious. And I love that photo of you and your mom. Priceless! Fantastic! Hope you had an awesome mother’s day. Thanks, Lail; the very same to you! Late comment, but a beautiful loaf and nice images. I’ve missed your blog posts as I am abroad and internet is not always available. But I am glad to catch up on them, especially this one. Where on earth did you get Spanish honey from?!? PS The Spanish honey is from Zingermann’s in Ann Arbor. i should’ve guessed as much!! that store has everything! so lucky! Must Try Sweet Treats: Double Chocolate Brownie Cookies; Chocolate and Vanilla Cupcakes!